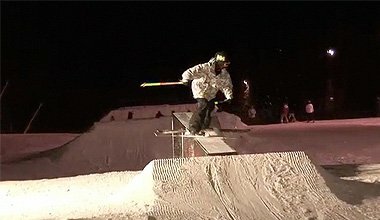 36 Hours of Keystone is an event with a brief history in comparison to those events such as the X-Games, U.S. Open, and or the Vermont Open. But while this competition is relatively new, it doesn't mean that no one misses it. This competition isn't just for invites and for those who can slide a rail or do hand plants in a night lit quarter pipe. It actually is the chance for teams of 3 or 4 to enter to win a pretty large sum of money, simply by having someone complete a full lap of the mountain each hour of the 36hrs. As the 1st day dragged on the crowds haven't really arrived, but once 6 p.m. hits on the eve of that first night, the life on the mountain triples as does it in the small mountain village at the base of the River Run Gondola. The likes of Matt Walker, Christian Allen, and Michael Clarke, all showed up and appear in the video in this order, hit the slopes around 10 p.m. to session the minimal single park and leave open only 4 features, but it didn't mean the skiers wouldn't have fun! Now as most teams actually end up finishing the race, there are quite a few prizes handed out to those teams that are able to finish the challenge. Mind you this event sounds like a piece of cake, it really is quite a challenge and takes a lot of focus to get back to the lifts, and involves a lot of time waiting in alcohol check points and or long lift lines with the rest of your competitors, time is something definitely not on your side, and is something that requires your immediate focus each and every counting 36 hours. Next year I would recommend everyone gets out to Keystone to enjoy this quite different event!